The Nigerien government and its allies' use of military force and non-state armed proxies to curtail jihadist groups along the Niger-Mali border is stoking intercommunal conflict. Niger should instead adopt a political approach which includes reconciliation, dialogue and, in some cases, pardons for militants. What's new? A new insurgency is developing along the Niger-Mali border. Jihadist groups, including a local Islamic State branch, have established a foothold in the region, exploiting recent instability in neighbouring Mali and insecurity that has plagued border areas for decades. Why does it matter? Efforts to curtail jihadists' expansion have involved mostly military operations, but their results thus far have been unconvincing. Western powers' overwhelming focus on counter-terrorism has neglected other factors of instability, and their backing of non-state armed proxies has stoked intercommunal conflict and arguably played into militants' hands. What should be done? The Nigerien government should adopt a more political approach including reconciliation among communities, dialogue, even with militants, and pardons for insurgents who have committed no serious crimes. Western partners should subordinate their military operations to such an approach, which would be more in tune to local needs. Clashes along the Niger-Mali border have claimed dozens of lives over the past few months. For years, the circulation of weapons and increasing intercommunal tensions have contributed to the region's mounting insecurity. Since Mali's 2012 crisis, jihadist groups have capitalised on local unrest and the state's weak presence in northern Mali to establish a foothold and launch cross-border attacks against the Nigerien army. Efforts to curtail jihadists' expansion have involved mostly military operations; the results, thus far, have been unconvincing. The use of militias to fight jihadists has aggravated intercommunal conflict and arguably played into militants' hands. To prevent a new insurgency in the Sahel, the Nigerien government and its Western partners should subordinate military action to a political approach that includes efforts to engage in dialogue, even with militants. They also should pursue a longer-term strategy of disarmament and reconciliation among communities along the border. Over the past two decades, violence has gradually become more acute in rural areas on the Mali-Niger border, as neither the Malian nor Nigerien government has been able to regulate increasing competition among local communities for territory. In the wake of the Arab-Tuareg rebellions of the 1990s and 2000s, the increasing availability of weapons has changed the nature of violence, making it much deadlier. It has also led a generation of young men, drawn mainly from nomadic communities, especially Tuareg, Dossaak and Fulani, to earn their living with guns. 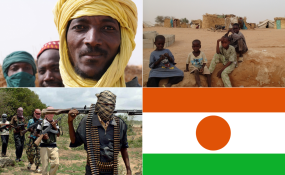 Politicians have often used such men to form community militias, mainly in Mali but also in Niger - notably in the form of the Fulani militia in North Tillabery, a border region in south-western Niger particularly affected by violence. Such groups claim to defend marginalised nomadic communities' interests, but often their behaviour is predatory and they use violence to pressure the government in the hope of extracting benefits. The Malian crisis in 2012 further destabilised the region. It accelerated weapons proliferation and allowed jihadists to gain a foothold by recruiting combatants from the most fragile communities, albeit often on a temporary basis. Young Fulani men in particular joined such groups, less because of ideological affinity than out of opportunism and to obtain weapons to protect their communities from others. After being chased from Malian towns by the French military operation Serval in early 2013, the jihadists re-established themselves in rural areas of Mali and then Niger, often by exploiting tensions among different nomadic communities and those communities' distrust of the state. The jihadist presence along the border does not, however, represent a unified militant front. Instead, several groups loosely cooperate on a pragmatic basis, even if some are affiliated to more structured movements such as local al-Qaeda and Islamic State branches, which in principle compete for influence. Niger and its partners, notably France and the U.S., have reinforced their military forces in border areas - as illustrated by the October 2017 clashes in remote border areas during which several U.S. servicemen died. Such operations, however, have not contained the violence. As the Malian state remains absent from much of northern Mali, the Nigerien authorities and the French military have attempted to secure the border by working with Malian non-state armed groups, notably the Self-Defence Group of Imrad Tuareg and Allies (GATIA) and the Movement for the Salvation of Azawad (MSA). But despite some military successes, relying on such groups for counter-insurgency operations has further aggravated intercommunal tensions and threatens to provoke a major escalation of violence in the region. Alongside military operations, the Nigerien government has attempted to engage in a dialogue with some insurgents. This option, too, faces multiple challenges. Jihadists themselves appear divided as to their interest in engaging with authorities. Self-proclaimed representatives of Fulani communities compete for the role of mediator and disagree on how to demobilise young men who have joined militant groups. Counter-terrorism operations can serve to pressure such groups. But unless they are carefully coordinated with efforts to establish lines of communication between belligerent parties, they also risk disrupting those efforts. Move beyond counter-terrorism. The government should distance itself from the current prioritisation of military action, often driven by its international partners. It should develop its own model for managing conflicts in border areas, based on a better balance between dialogue and the use of force. Western partners, especially the French, should be more open to reviewing their current strategy with regional leaders. They should adopt an approach that includes military operations - clearly still a critical component of the response - but better subordinates them to a political strategy that includes efforts to calm intercommunal conflicts and engage militants, is defined by Sahelian societies themselves and is more in tune to their needs. Continue efforts to engage armed groups, including jihadists. The Niger government has established contacts with jihadist groups but attempts at dialogue have proven difficult. It should accompany these efforts with a policy of pardoning insurgents except for those, jihadist or otherwise, who have committed serious crimes, such as the killing of civilians. Alongside government initiatives, meetings between communities, supported by non-governmental organisations and/or civil society, could also reduce tensions. A project for the administrative reorganisation of the North Tillabery chefferie (local government unit) in partnership with all communities living there and aimed at improving minority nomadic communities' representation, could facilitate dialogue. Suspend the use of community-based militias in counter-terrorism operations and integrate them into temporary joint patrols. Non-state armed groups, whose role in operations against jihadists aggravates intercommunal tensions and violence, should be integrated into temporary joint security patrols, together with regular forces where possible. Patrols that are part of local security provisions in Ménaka, a northern Malian town near the Niger border, and its surroundings - which are supported by the French forces and the UN mission to Mali - offer one model; it should be strengthened and applied elsewhere. To attract the widest possible support, these initiatives should include representatives of all local communities, especially Fulani nomads that are not well integrated into security arrangements. Provide humanitarian support and promote economic development in border regions. The Nigerien government and its international partners should urgently facilitate humanitarian access to North Tillabery to both provide aid and independently evaluate the local population's needs. In the medium term, economic development could involve small-scale projects - the construction and maintenance of "peace wells", for example - though such projects, which can provoke envy and tension, should be undertaken with care and aim to promote peace among communities. The government must improve services, including education, health and justice, in marginalised areas and adapt them to nomadic communities' needs, notably by making them more mobile. Overall, it must better provide for the security of communities in border areas. Absent that, those communities will seek to protect themselves with guns.